While I'm navigating my life through Los Angeles ( and in general) I decided to create a sacred space to keep me centered and balanced. A few people I follow on Instagram have alters and I decided that I wanted to create one for myself. I'm proud of the space I created and can't wait to expand on it. In the mean time check out pics below! I went to this event and fell in love with this piece by this amazing artist Madam Muse. I definitely can relate to Celie and Shug Avery. Color Purple is one of my favorite films and this painting resonated with me. I wanted it to be part of my alter and luckily it flows well with my color scheme. My mother asked me if I wanted to keep this bible and I said no. Then she said that it was the bible that my grandmother gifted me for Christmas and then I said of course. I decided that I wanted it to be part of my alter because I wanted something to honor and represent my grandmother. She has been a major part of my life and now that she has passed I wanted a piece of her with me. So the base of my alter is an African print fabric. It was gifted to me from a production I worked on. I was gifted different prints but this one spoke to me the most. Since my print is dark I wanted to add lighter pieces to my alter. I found these candles, vase and long wooden bowl from Ross. These candles has an energizing scent and I light them in the morning to start my day. I love the shape and color of the vase because it adds more character to the space. I chose this wooden piece because it is small and a light color. I only have a few stones and wanted something separate to keep them in. Of course my tarot deck is part of my alter. I have been teaching myself how to read tarot cards. I use to be weary of them because of my Christian upbringing but I've only had positive experiences once I started receiving readings. I'm definitely excited about becoming more familiar with my tarot cards. On this side of my alter I have a lavender serenity candle that I purchased from...you guessed it.. Ross! I light this candle in the evenings as I wind down from the day. This area is where I keep my cleansing tools. My roommate gave me this circle mirror and I thought this was a cool place to keep my sage and palo santo. Also, this is the side of the table that I keep my journal on. I have no idea why I choose this to be it's destination but it is! I use to have a gratitude box so this time around I decided to do a gratitude bowl. I got this from Ross as well. They took all my coins that day! This is where I jot down my intentions that manifested or unexpected miracles. On my new year ( bday) I will read them and reflect on my blessings and gift from the Universe. I visited the Los Angeles Flower District and found some plants and leaves to add some life and pop of color to my alter. I have to admit the Flower District was overwhelming, especially for a person that does not know much about plants. I ended going to a seller who was helpful and patient with me asking questions. 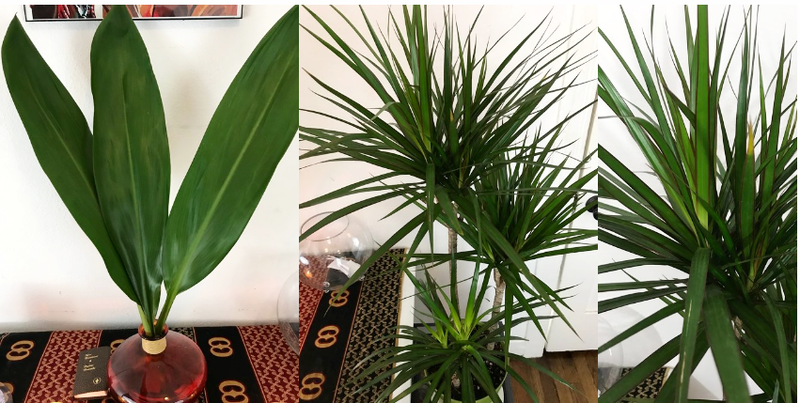 I purchase some leaves and a Dragon Tree (Dracaena Marginata). You can definitely spend a lot of money at the Los Angeles Flower district if you don't know what you are looking for. Luckily, I did not bring too much cash and the ATM machine in the building was broken because I would have definitely bought more than what I intended to. I will visit Flower District again. I want to add some more plants and flowers in my space. This ends my alter tour! I am going to add more pieces along the way. I didn't want to over-decorate because I want my alter to grow as I grow.